Every now and then you’ll hear that a full moon is designated a blue moon and therefore of particular astrological significance. But you may also notice that different people designate different moons as blue, which can get rather confusing! In fact, there are three different types of blue moon: calendrical, seasonal and astrological. Whilst some people consider seasonal and even calendrical full moons significant, I explain below why I favour astrological blue moons as most worthy of note. A calendrical blue moon is the second full moon in one calendar month. Usually we have only one full moon a month, but if that occurs in the first couple of days of the month the next full moon may be in the same month depending upon its length. For this reason a calendrical blue moon is more likely to occur in a month with thirty-one days than thirty days, and these blue moons never occur in February as it only has twenty-nine days at the most, which is not long enough for a complete moon cycle. This type of blue moon does not have astrological significance as calendar months are a human-made concept and for something to have significance it needs to be astrologically self-referential. For example, July & August have thirty-one days because they’re named after emperors who wanted more days in their months to reflect their importance. Nothing has yet convinced me that a second full month in a month shaped by an inflated ego would have more astrological significance! Furthermore, not all parts of the world use the Gregorian calendar and even in those that do, the existence of different time zones means some areas may have a calendrical blue moon on the last day of a month whilst in another zone it falls on the first day of the next month and is not therefore blue. For something to have an astrological impact it needs to be astrologically consistent across the board (that is, astrologically self-referential). A seasonal blue moon occurs when there are four instead of three full moons in one season of a tropical year (a tropical year being the time the Sun takes to travel from the vernal equinox point around the zodiac then back to the vernal equinox point again, from an earthbound perspective). The third of those four moons is called a blue moon. Seasonal blue moons are traditionally reported in farmers’ almanacs which name each full moon i.e. seed moon in April and harvest moon in September (such designations are hemisphere specific). The third of four full moons is designated a blue moon to preserve the name of the final full moon marking the end of a season. An argument in favour of giving astrological significance to such a moon certainly has more validity than a calendrical blue moon given its relationship to the tropical year. However, every seasonal blue moon occurs around the time of an astrological blue moon which, in my experience, has a stronger and more significant effect. Sometimes seasonal and astrological blue moons occur simultaneously i.e. a full moon is both in the same sign as the previous full moon and is the third of four full moons in one season. As I mentioned earlier, an astrological blue moon is the most important. This occurs when we have two full moons in one solar month, which means that during the sun’s passage through one zodiac sign the moon is full twice instead of once. The second of those moons is a blue moon. Because a full moon occurs when the moon is opposite the sun, the full moons both occur in the same sign as each other. Astrological blue moons occur roughly every three years and are always preceded a month earlier by a full moon in the first one or two degrees of the same zodiac sign. Just to clarify… is a blue moon actually blue? No, a blue moon isn’t blue, that’s just the name it’s given! So what’s the significance of an astrological blue moon? Ordinarily, and in (very) general terms, a full moon is a time of fruition and fulfilment, when actions taken, commitments and decisions made, bear fruit. The nature of this fruit reflects how effective our efforts and clear our intentions have been. In the light of a full moon we may see with great clarity how past actions have shaped our present, making connections and reaping results both anticipated and otherwise. The cycles which culminate at a full moon are not necessarily connected only with that moon cycle but may have developed over the course of many weeks, months or years. Every full moon has a deeply personal significance different for each individual, alongside its more general collective significance. Energy at a full moon is heightened favouring activity and effort, in contrast to the dark of a new moon when energy levels are low and the natural tendency is to retreat into stillness as a new cycle is born. An astrological blue moon is a full moon amplified. Its energy is expressive and dynamic, making it a good time to do what’s needed to bring things to fruition. Think of it as the final creative flourish that competes a masterpiece; the finale of an opera that leaves the audience breathless with excitement and emotion; the last minute rush to meet a deadline which changes our life. If we decide to use the energy of a blue moon to our advantage we can achieve great things with it. Like a full moon on steroids it will deliver potent results, so it’s up to us to be sure the efforts we make will deliver the results we want! Blue moons don’t pick and choose which fruit to ripen, so if we’ve invested our energy into unhelpful actions or mind states, or focused in self-sabotaging or obstructive ways, our blue moon harvest may not be to our liking! Just as with a full moon, blue moons don’t only deliver results from the current moon cycle but can connect with efforts made weeks, months or years prior. Moon cycles are woven through our lives in complex ways that can be unravelled and understood through natal chart analysis. However, you don’t need to be an experienced astrologer to understand something of what a particular blue moon means for you personally. You simply have to stop and take a good, honest look at your life at the time of the full moon prior to the blue one. Remember, this first full moon is in the same sign as the blue moon, so they are energetically connected. The first full moon acts as an initial phase of completion brought to deeper fruition come the blue moon a month later. For example, if at the time of the first full moon issues around work are significant for you, the month between the two moons will favour further action on the issues raised, ready for a substantive outcome at the blue one. 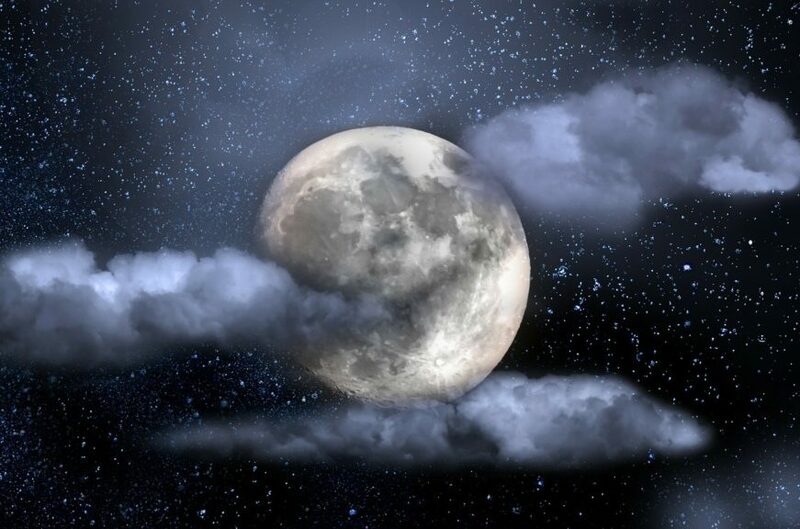 In effect the blue moon is a second bite at the cherry of the first full moon, enabling greater and more significant results to be secured. How we use that intervening period can be critical to how a blue moon impacts our life. If we avoid doing what we know needs to be done the blue moon will deliver the results of our avoidance (results we might also prefer to avoid!). If we tackle the relevant issues, act with integrity and commit to courses of action which we know to be necessary even if they’re not what we would choose in an ideal world, the blue moon will deliver results which reflect not only our efforts made but also the level of integrity invested in them. And remember! Effort is not only about doing. It may be making the effort to do nothing rather than react prematurely to circumstances. It may be an effort in relation to our emotional or spiritual life. Perhaps we need to commit to greater authenticity and refrain from certain behaviours which have become habitual sources of dis-ease and dislocation from our core self…. Careful consideration of the shape and hue of our life at the first full moon will enable us to reap the rewards of the blue moon that follows. I only discovered a blue moon was approaching after the initial full moon of the solar month! Does that mean I’ve missed the boat?! No! Absolutely not, so don’t panic, all is not lost! The important thing to remember about a blue moon is its power, so resolve to use it well whatever preparation you have or haven’t managed to carry out. Wherever you’ve been investing your effort and attention in recent times can benefit from the power of the blue moon, so use it to bless efforts beyond the call of duty and investments of energy that have called us out of our comfort zone into new and uncertain – but nonetheless rich with potential – territory. Whilst a blue moon delivers significant outcomes, few harvests are the absolute final word on a matter! Once we have reaped what we sowed we prepare the ground to sow again. A Blue Moon both offers up the rewards for efforts made and fertilises the soil of our life for the next stage, enabling us to see how we take forward the outcomes of our past to date. How does a blue moon impact our natal chart? If you’re familiar with your natal chart you can work with a blue moon more specifically by observing where the sign of both full moons sits in your chart. The affairs of the house or houses in question will be of great importance during the month framed by the two full moons. The expression of any planets within that sign will be both tested and amplified during that time, revealing some of their most potent issues in your life. This may result in some challenging moments for sure, but within those challenges profound insights await revelation. A blue moon month removes the veils of ignorance and allows us to see ourselves for what and who we are if we’re prepared to look without guile at all that’s revealed, relinquishing our habitual avoidance mechanisms as much as possible. Thus its fruits are both more generally influential and more specifically reflective of how we’ve lived to date. The secret of a positive blue moon experience is resolving to live as authentically and honestly as possible in those areas highlighted in our chart, endeavouring to deconstruct the false self of defensive posturing, finger-pointing and self-criticism in favour of a more open-hearted relationship with ourselves, each other and life itself. When we welcome its wisdom in this way, we gain more intimate knowledge of our life, which enables us to live it with greater awareness and connection in the months and years to come. Blue moons are rare events so best use them wisely! They turbo-charge our commitments, potentise our efforts and boost our harvest. They can also change the course of our lives at times, setting us on a different track or bringing to a climax issues which have rumbled on for months or even years, clearing the air for a new beginning in the weeks and months to come. Whoever we are, whatever our circumstances and no matter our astrological acumen, we can all use the energy of a blue moon to focus our intent and glean deeper insight into who we are, what makes us tick and how to reinvest current outcomes to forge a positive, productive and perhaps most important of all, authentic, future.